The UST SagFighterNXT is a breakthrough in single-phase voltage regulation that can help you to avoid repurposing UPS power-backup systems as voltage regulators to compensate for frequent sags. With no batteries, in fact with no energy storage of any kind, UST SagFighterNXT smoothly and continuously regulates voltage to within +/-1% of nominal. The SagFighterNXT is the battery-free, SEMI-F47 compliant alternative to UPS systems for protecting critical processes in semiconductor manufacturing, automated production, computing, scientific and laboratory applications. The SagFighterNXT is purpose-designed to compensate for sags and other common voltage anomalies in single-phase applications between 2.5kVA to 10kVA. The single phase solid state device delivers smooth and continuous voltage at +/-1% nominal by correcting both overvoltage and sags within 1/2 cycle. The UST SagFighterNXT is the UPS replacement in cases where voltage sags, not power failures, are the primary concern. 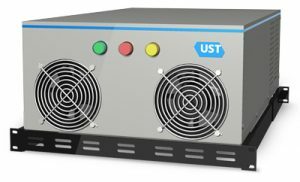 At a cost per kVA comparable to UPS systems – before factoring in battery monitoring and replacement costs – the UST SagFighterNXT is the new perfect power solution. The single-phase solid state device delivers smooth and continuous voltage, correcting both overvoltage and sags to +/-1% within 1/2 cycle. for more information on the UST SagFighterNXT.